The launch of our Dementia Arts Photo Challenge! The Panel leading 'The way I see it', a Created Out of Mind discussion event at Wellcome Collection. Pictured (l-r): Hannah Peel, Fergus Walsh, Philip Ball and Caroline Evans. We launched Dementia Awareness Week with a campaign to enrich perceptions of dementias and the arts. See some of the evocative images shared so far in our Instagram gallery and keep sharing- we are running the campaign until 31st May 17. More information available here. Members of the public joined Created out of Mind collaborators for 'The way I see it', a discussion event at Wellcome Collection on Thursday 11th May, exploring how we might open up new conversations and perspectives about dementia through media, music and storytelling. Our leading panel of speakers included BBC medical correspondent Fergus Walsh, artist, singer and composer Hannah Peel and science writer Philip Ball. After a short introduction by Wellcome and our Associate Director Caroline Evans, the event kicked off with a talk by Philip Ball who explored references to dementias in literature and the role of storytelling in helping societies to resolve dilemmas and confront difficult realities. Next, Fergus Walsh used archived news footage to demonstrate different representations of dementia experiences and the responsibility of the media to help inform public understanding, and subsequently support and funding. He recalled a time when 'Cancer' was an unspoken word; dementia is now at the beginning of that journey. Finally, Hannah Peel spoke openly about her experiences with her Grandmother's dementia and how music became a tool for understanding & communication between them. Drawing from these personal experiences Hannah began to develop a sound palette to imagine a different world; and then her critically-acclaimed album 'Awake but always dreaming'. was born. She concluded with her moving track from this album: 'Conversations'. The event was fully booked and the audience were knowledgeable and engaged. There were lots of questions and rich discussion, and feedback so far has been very positive with people calling the event 'interesting', 'thought-provoking' and 'inspiring'. "We're all in this together"; hearing from the Mayor of Camden at the Camden Dementia Action Alliance Conference on Mon 15th May. Julian West introduces Created Out of Mind at the Camden Dementia Action Alliance Conference at the London Canal Museum. 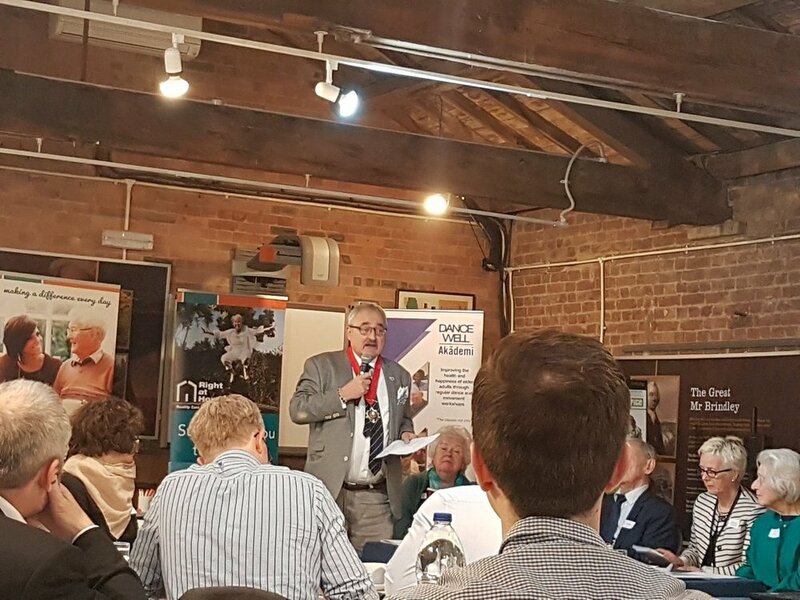 We went along to the Camden Dementia Action Alliance on Monday 15th May, hosted at The Canal Museum in Kings Cross, London. Our Co-Director Julian West presented Created Out of Mind's key aims, research themes and vision to a diverse audience, including representatives of 34 local organisations. People living with dementia and carers spoke movingly about their experiences and challenges, and why it is so important for local communities to provide them with opportunities to engage and thrive. Camden is a leading London borough in championing dementia-friendly spaces and support. Local politicians including Councillor Alison Kelly, who is chair of the Camden Dementia Action Alliance and the Mayor of Camden, Councillor Richard Cotton stressed the importance of keeping up this momentum and setting an example for all boroughs to join together in meeting the challenge of dementia. Learn more about the Camden Dementia Action Alliance. Our Project Manager Emilie Brotherhood at the Created Out of Mind stand- demonstrating some smart tech and arts created with people with dementias for the Alzheimer's Society Annual Conference 2017 in London. Royal Academy of Music composers present a recital of eleven new songs. Several of the works were inspired by the texts brought together in the Living Words publication 'The Things Between Us', a collection of words and poems of people experiencing dementia. In association with Created Out of Mind collaborator Living Words, Royal Academy of Music composers presented a recital of eleven new contemporary songs for soprano, two clarinets, viola and double bass at a performance on Tuesday 16th May. Several of the composers whose works were being performed in this concert were inspired by the texts brought together in the Living Words publication 'The Things Between Us'. It was wonderful to see the words of people living with dementias brought to life in a new, engaging way. Created Out of Mind presented an exhibition stand at the Annual Alzheimer's Society Conference in London on Thursday 18th May. Using installations and ceramics created with people with dementias and smart technology, we demonstrated how science and the arts can come together to enrich dementia experiences and perceptions, and create new tools for communication and understanding. We joined exhibitors and delegates from across dementia research, policy, care and communities to discuss how best to improve the quality of life for people affected by dementias at the Alzheimer's Society's biggest-ever conference. Highlights included: Hearing the new Dementia Statements from people living with a diagnosis; Hilary Doxford presenting the new Three Nations Dementia Working Group; a talk from UK Dementia Research Institute (DRI) Director Bart de Strooper on bringing international partners together to break knowledge barriers, and a political panel on rising to the challenge of dementia this General Election. An inspiring and thought-provoking event! Laughing, learning and creating at the 'Words and Letters’ printing workshop led by Charlie Murphy and Pixel Press. An evocative piece from the ‘Words and Letters’ printing workshop led by Charlie Murphy and Pixel Press. On Friday 19th May, Created Out of Mind visual artist Charlie Murphy and Pixel Press teamed up to lead an experimental printing workshop. Hub collaborators, people living with dementia, carers and family members came together to play with letters and words using different printing processes, type and materials. They worked together to create postcards, posters and notes which expressed something that was important to them. From quotes, jokes and meaningful words to poignant observations, everyone got involved and produced some wonderful pieces- represented in type using letterpress, paper, leaves, wax and light. So that's our week in short, but there is still much more to come! Please keep checking in on our website Events pages and subscribe to our newsletter to get the latest updates on news, events and other opportunities to get involved with Created out of Mind.